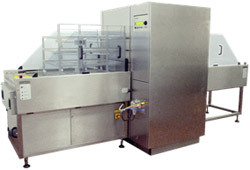 Universal design concept adaptable to suit most makes of basket loading double door 'pass-through' type washing and disinfecting machines as used in hospital Sterile Services Departments. The stainless steel unit with integral drip collecting tray automatically transfer loaded baskets into and out from the washer with a smooth, safe and reliable action or in conjunction with a low cost dedicated unloader unit can provide a fully automatic loading and unloading operation. Under development : Extended version with twin basket handling capability for double door washers in SSD's with high throughput. Both manual and powered conveyors can be supplied at any length, and to carry various loads. 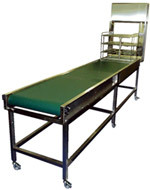 Conveyor systems designed to greatly reduce manual handling. Work stations available with packing tables sited along side powered conveyors for greater throughput of product. Conveyance equipment can be processor controlled enabling interfacing with existing equipment. Conveyors can be built as an integral component of Transfer Hatches, and other through the wall applications.